Throughout my journey, every bookstore I visit I learn something. What I learn on my visits is not always limited to books and bookstores. 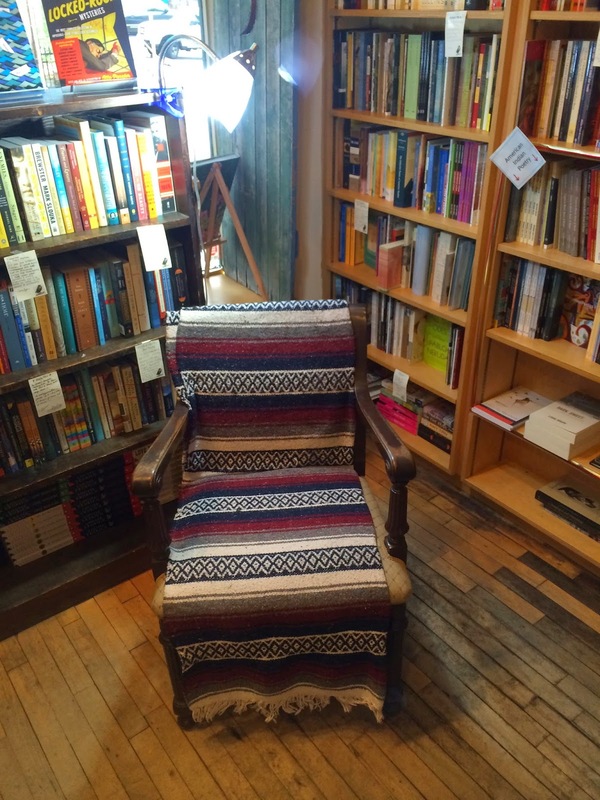 At Birchbark Books in Minneapolis, I was immersed in a culture of Native America. Language, people, art, books, authors, music and anything else you can imagine. 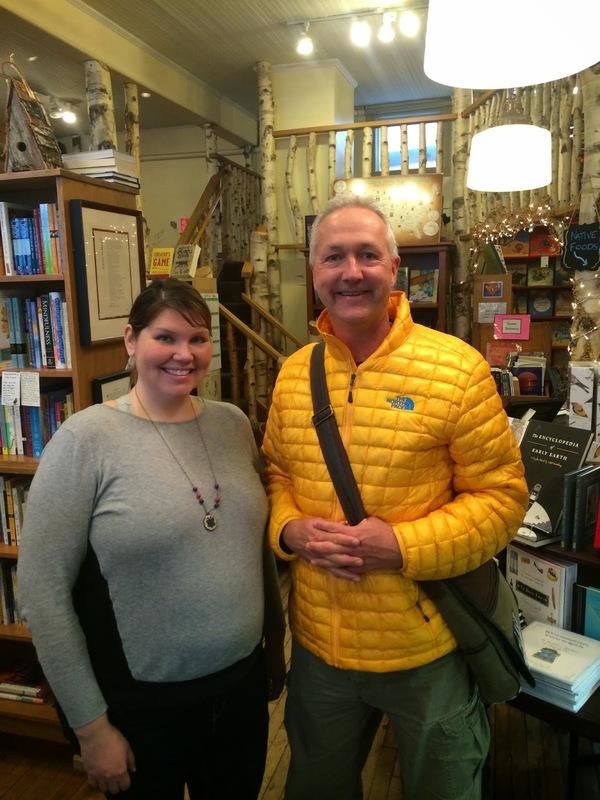 This is not only a fine independent bookstore, it's an experience and a beginning to learning more about our nation's Native American heritage. This is a small, one-level (except for the tree house), neighborhood bookstore where you can find current best seller releases like ones offered at other indies, but you can also find many things related to Native Americans, including the Ashinake people. Renowned author Louise Erdich, is a Native American and also owner of this independent bookstore. 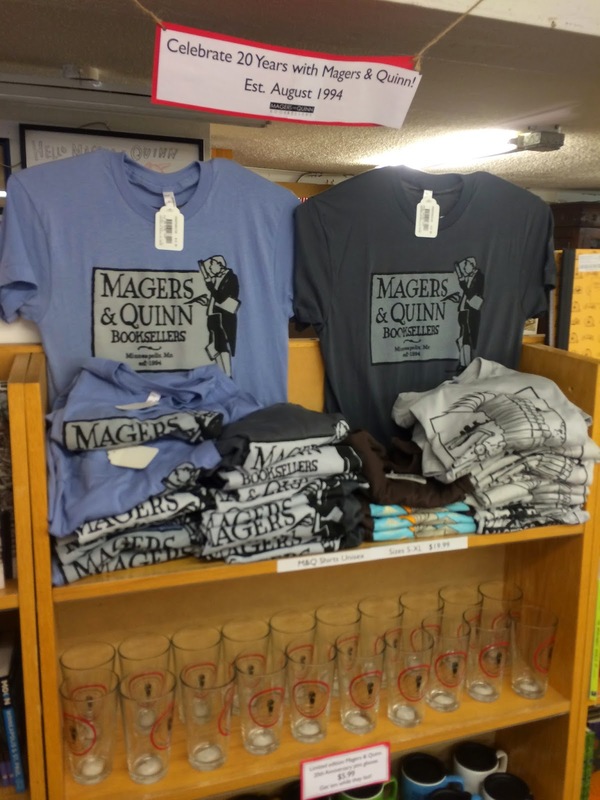 She also wrote one of the essays in My Bookstore, about Magers & Quinn, also in Minneapolis. You'll find all kinds of topics on Native Americans in every genre, including children's books and young readers. 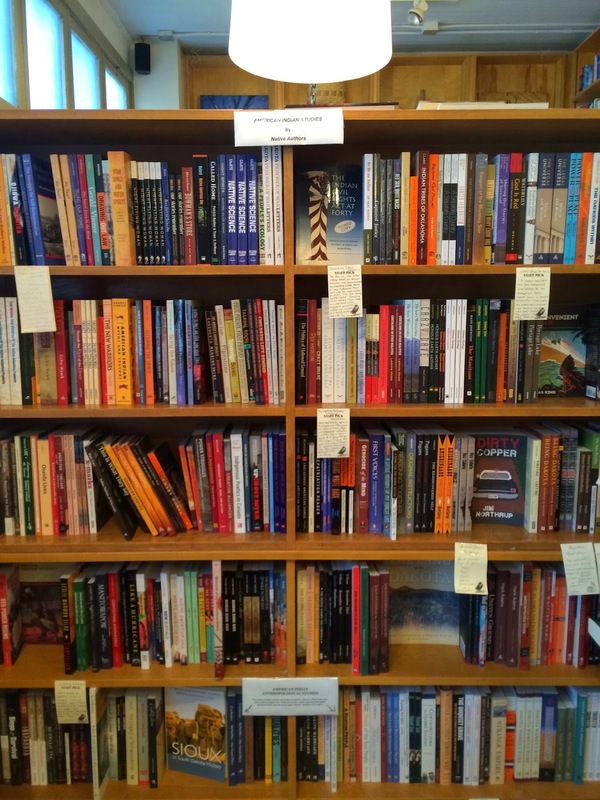 There are many books here written by Native American authors and you'll also find many anthropological studies. 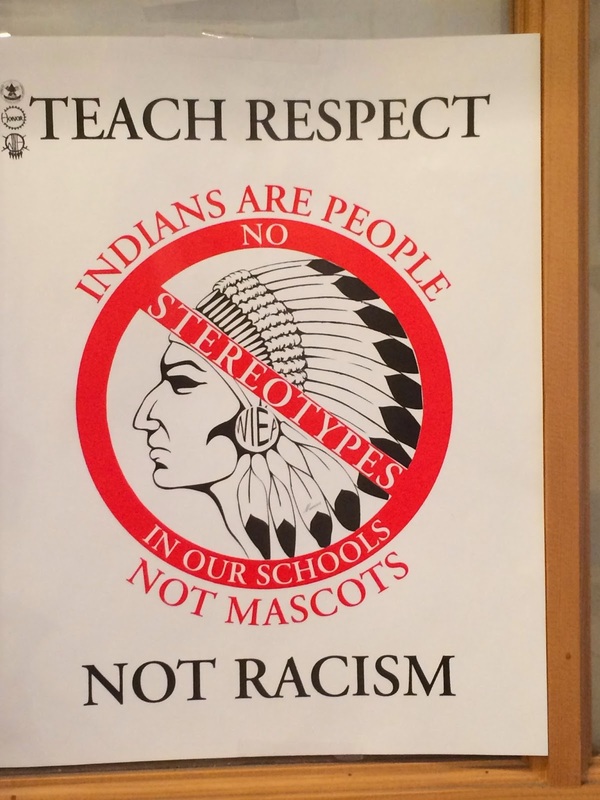 All of the sidelines here are related in some way to our Native American heritage. 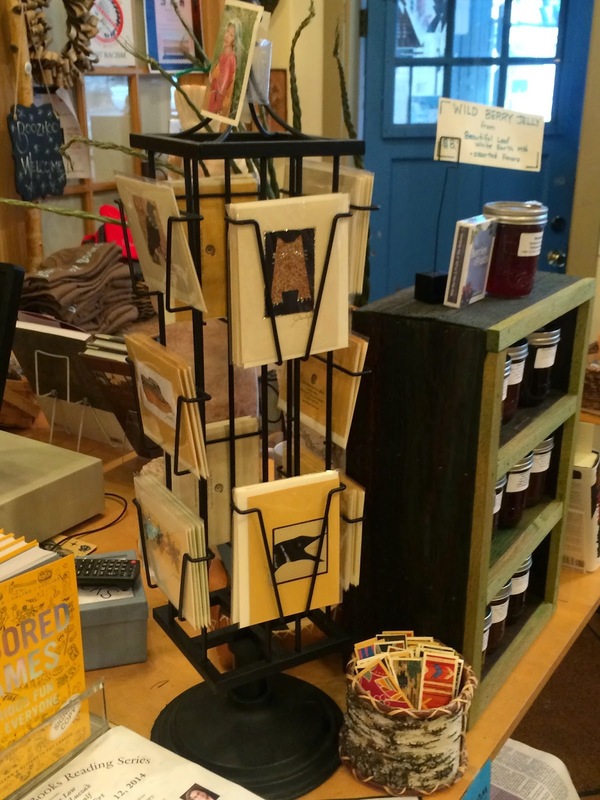 Greeting cards that are done by local artists, local art work, bird houses made of recycled wood, jewelry, ointments, healing sage, and more. 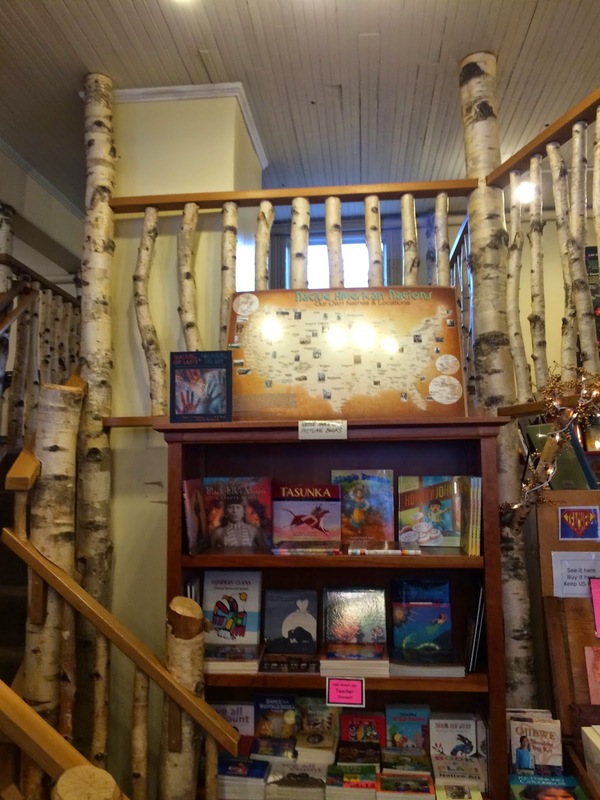 Parts of the store include the trunks of actual birchbark trees. There is a tree house that you can go up and look down into the children's section, all made of birchbark. This store has been here for 15? years and is very well supported by the local community but it is also a destination for many tourists who come specifically to this store for its Native American books and items. I didn't get to meet Louise Erdich during my visit but I did get to meet and talk to Elizabeth and Nate. Elizabeth was very helpful and told me a lot about the store, the Ojibwe (oh-JIB-way) language, the Ashinake people, and more. This store is truly a wealth of information for people who want to understand and learn more about Native Americans. 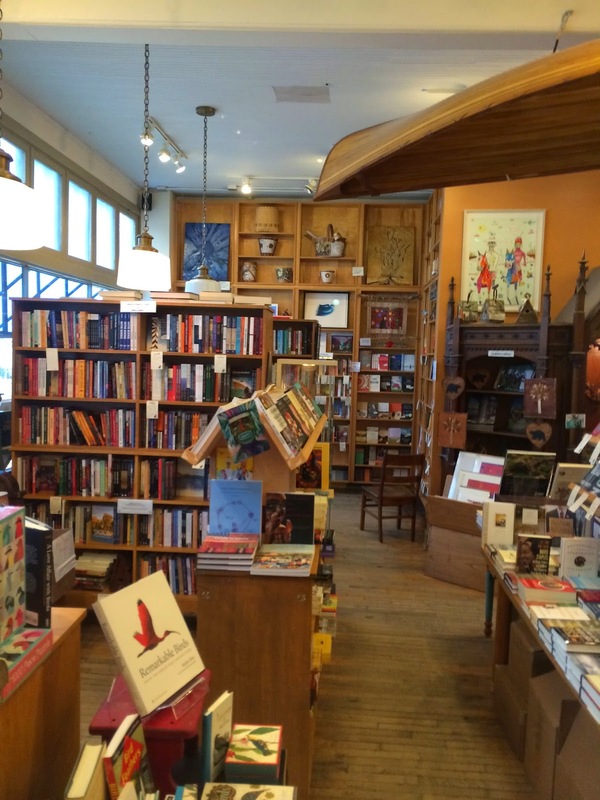 I would like to offer my miigwech (thank you) to the staff at Birchbark Books for a wonderful visit to a super and unique independent bookstore that if you take the time to visit, will teach you a lot. But part of your education will be buying a book there before you leave. Go to an indie and buy a book. Bonsoir. CURRENTLY READING: The Cuckoo's Calling, Robert Galbraith. Seems like it's taking a long time to get to the resolution but I'm almost there. Author is pseudonym for J. K. Rowling, who wrote the Harry Potter series. RECENTLY PURCHASED: The Orenda, Joseph Boyden. Great window display and entrance to the right. Looking into the store from the front entrance. Looking directly to the left from the entrance. A great display of staff picks. American Indian studies by native authors. Looking up at the treehouse from the main level. A great view of the store looking down from the treehouse. Looking down and to the left from the treehouse into a portion of the children's section. Some of the sidelines featured here. Many of the greeting cards are by local artists. Jewelry available here, also by local artists. If you don't know what boozhoo means, they provide the translation! A great sign for any store! 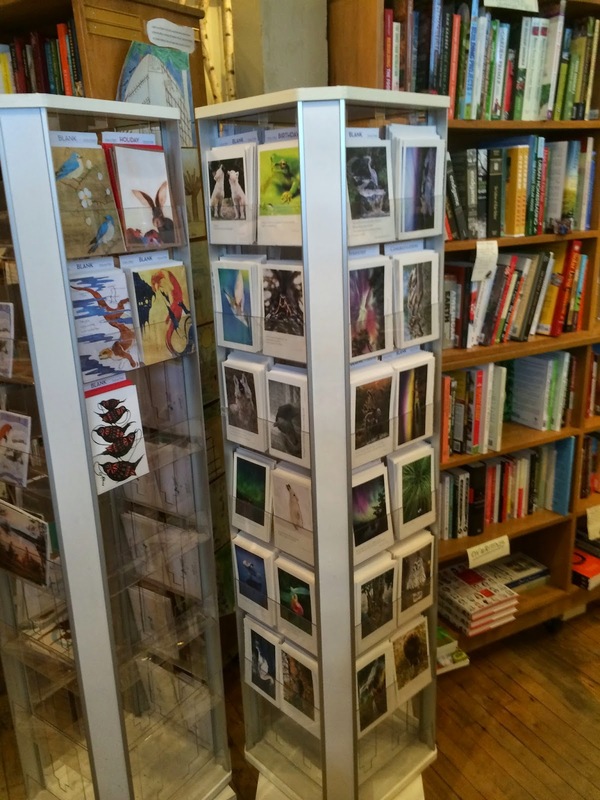 Great assortment of greeting cards. I've been to a lot of bookstores and seen a lot of sidelines but don't think I've seen birdhouses made from recycled wood! Another great place to try out a book. More items made by Native American artists. Elizabeth was great to visit with and tell me about the store. 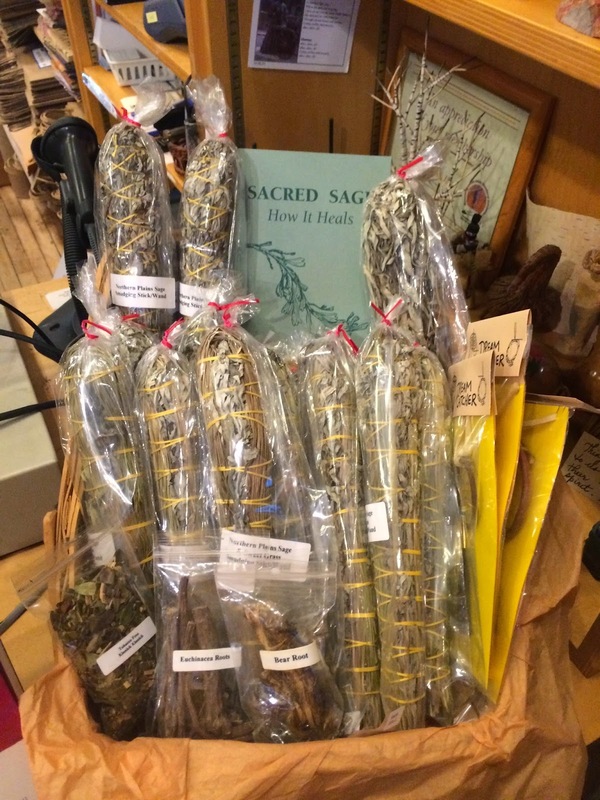 You haven't found any sage in other bookstores? Look no further, here it is! Readers, you know I've got your backs right? You know that in my marathon journey of bookstores that I'm always looking for a great store in a great location. I'm aware that many of you may have interests beyond just books. I think I've found the place for you in St. Paul, Minnesota. This great bookstore has a wonderful cafe/bakery across the street where you can enjoy lunch or breakfast, The Finnish Bistro. And next door to Micawber's is a wine shop. Books, coffee, lattes, baked goods, a lunch menu, and wine. You're welcome. Micawber's is named after a David Copperfield character who has an eternally optimistic nature. What a great attribute for any indie and especially here at Micawber's. Like many independents, this one is going through some challenges. But since it has been here for over 40 years, it has developed a devoted local following. It is located in the St. Anthony neighborhood of St. Paul and many here are rallying to support this indie, to keep it in business, and help them move forward. A perfect example was an older lady from this community who was here buying a few books but refused to take her customer discount. 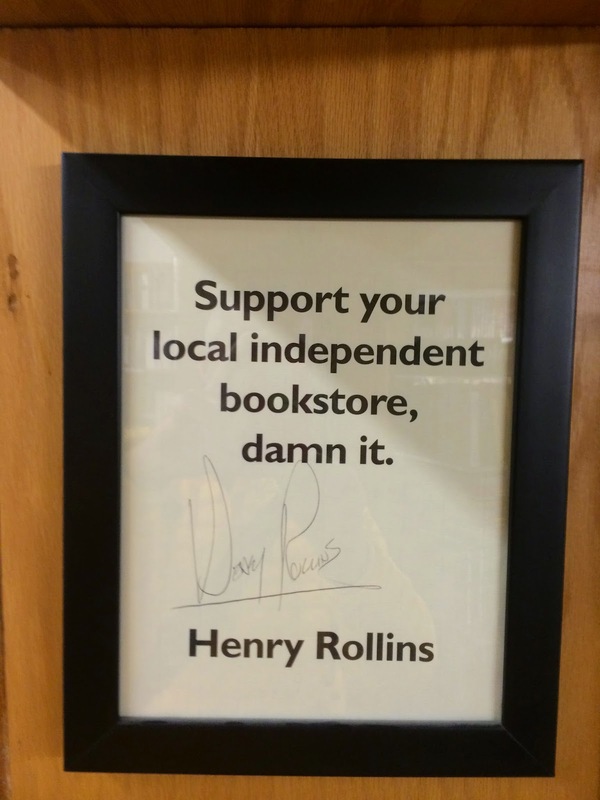 These are the kind of loyal customers independent bookstores have, as I'm sure many of you know. Here at Micawber's, I think there are many customers like this. This store is housed in a very old building that many years ago served as a post office for this community. The store is on the small side for independents but is big on character and charm. One level of books, divided into three rooms including a great room for children's books. They also hold frequent author events in this room. 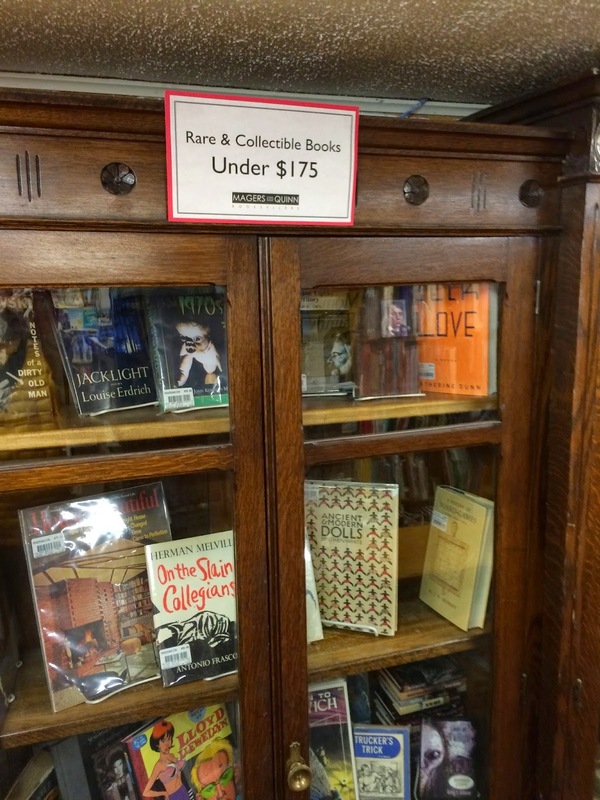 Micawber's doesn't have used books but they do have "remainders" available at great prices. There are no sidelines here so their business is books. There is also a great section for local and Minnesota interests. I didn't get to meet Tom, the owner, on this visit and I found out when arriving that my chances were 50/50 of meeting him. This place is a two-person operation, Tom and Dara, a bookseller. That's it. An owner and staff of one at one of the countries great indies. So on this day I met Dara who was fantastic to talk to. I learned a lot about the store, its challenges and history, and the independents of the Twin Cities. 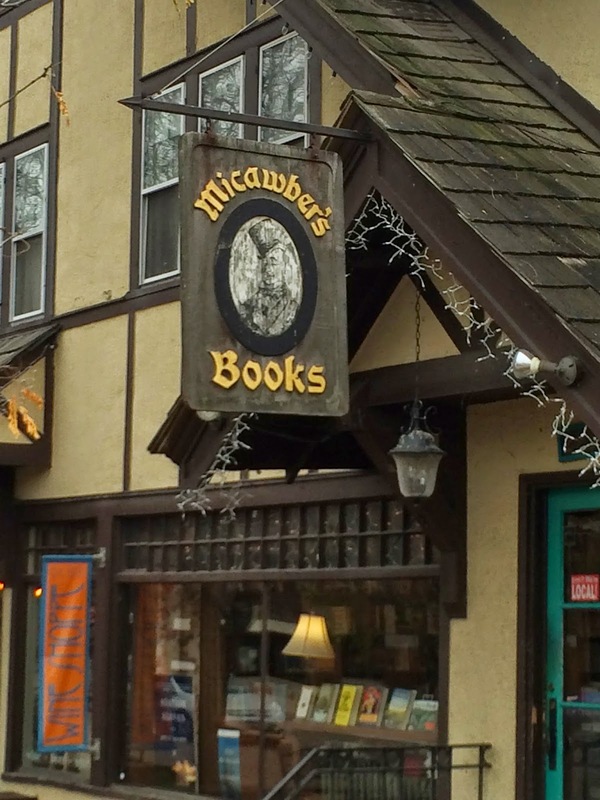 You will enjoy your visit to Micawber's and it is very accessible with free parking in numerous places. It will feel like a visit to a neighborhood bookstore. And as if I need to remind you, there's wine close by. Could there be anything better? Don't pass up a chance to visit this wonderful bookstore. And if you're in the Twin Cities, you must go and support this terrific independent bookstore. Go to an indie and buy a book. Bonsoir. CURRENTLY READING: The Cuckoo's Calling, Robert Galbraith. Author is a pseudonym for J.K. Rowling, the Harry Potter author. RECENTLY PURCHASED: The H-Bomb And The Jesus Rock, John Manderino. Mr. White's Confession, Robert Clark. 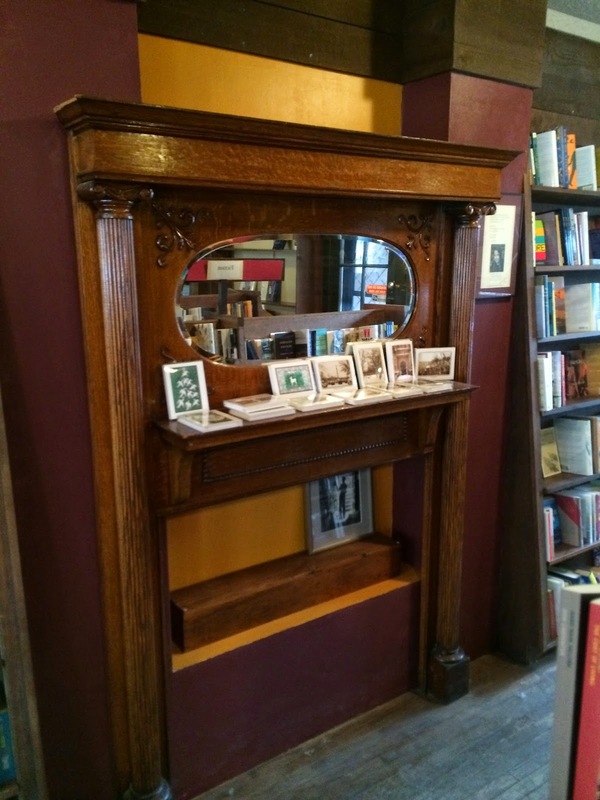 Beautiful, historic building, Micawber's Books. View looking to the left as you enter the store. View looking to the right, the center room, and then further over the children's section and author event area. Looking toward the front of the store from the back of the main room. This is the middle room. Children's and young reader's room and author event area, a great space. Good selection of local and Minnesota interests. With Dara at Micawber's. Thanks for a great visit, Dara! Like many independent bookstores I've visited, this store had a life before books. It actually has been a few different businesses including a thrift store and back in the 1950s a Chevy dealership. 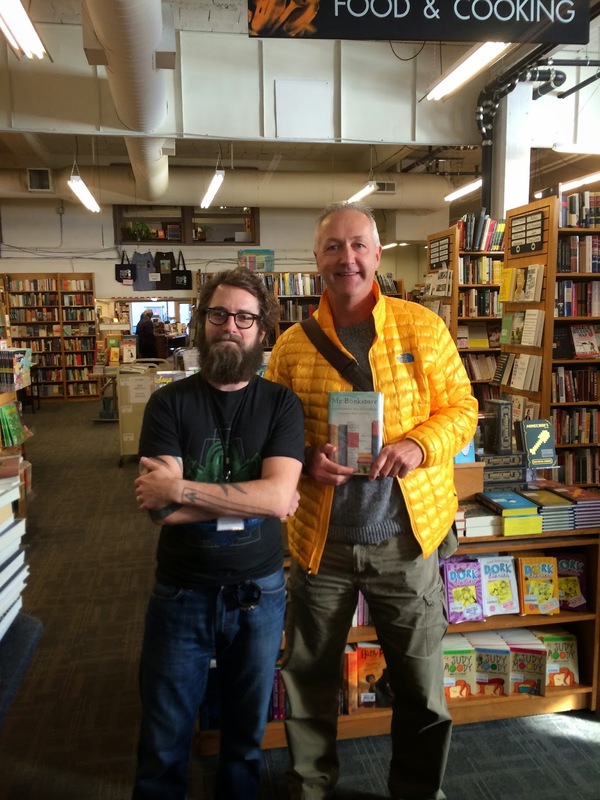 Elliott Bay Books in Seattle was another indie I've visited that had a former life in the automobile world. But no other future lives here at Magers & Quinn. It's been thriving and surviving 20 years and the future looks great. This is a very large and spacious one-level bookstore. When you first walk in you don't notice the size, but the place spreads out as you proceed through the store. The inventory includes new and used books and the shelves are floor to ceiling in many places. There is an active book buy-back program and the store offers cash or credits. If you're a regular customer, take the credits; you'll get more bang for your buck. Some indies don't have their used books on inventory but they do here. The entire space of the main level is duplicated in size on a lower level and serves as a great warehouse area for the store. In addition to the vast new book inventory, you can also find a variety of typical sidelines including book bags, t-shirts, and greeting cards, among other things. There is also a good sized collection of rare and collectable books. I didn't get to meet Denny M., the owner, or his daughter Mary M., the manager, on this day but I did meet Conrad, a bookseller and buyer for the store and Sara. These two were fantastic to talk to and Conrad told me a lot about the store and the history and even gave me a quick tour. The sidelines are minimal and he told me that books do well here. 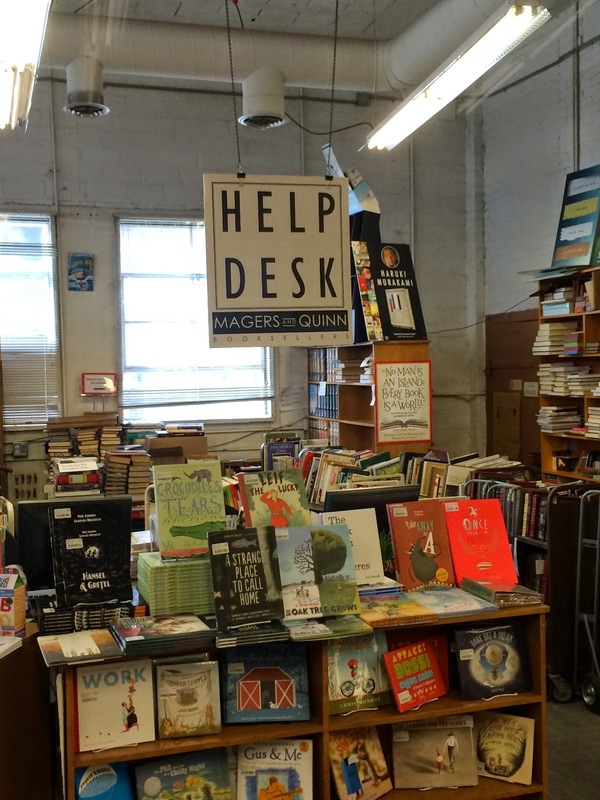 Used books and remainders have really helped the success of this store. There is strong local support, a common characteristic of most indies, and it isn't too far from the University of Minnesota so they do attract some academics from that community (as an Iowan, this would be where I would insert a stereotypical joke about Minnesotans and academics, but I digress). The store has the size and inventory to be a destination for non-locals and does attract those customers. 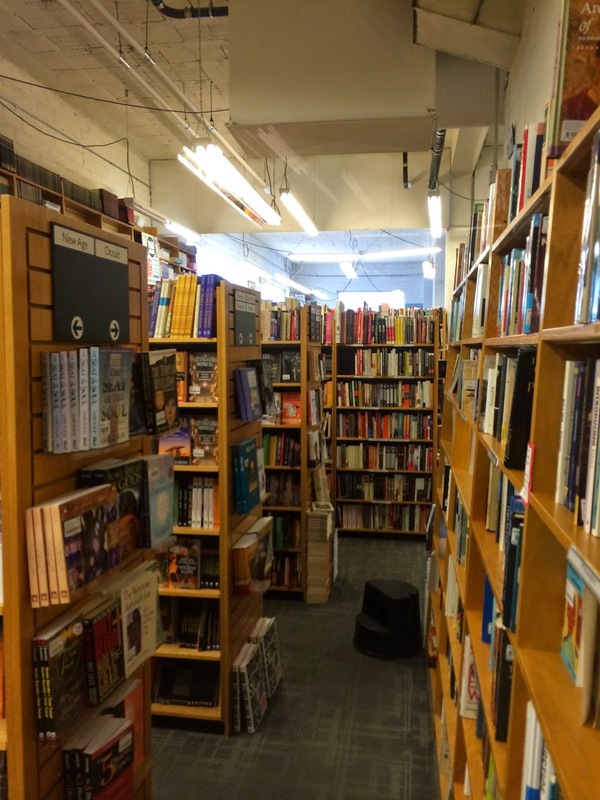 Like other successful indies, this store is active with author events and they are held on site or at other venues depending on the crowd and circumstances. I spent a good deal of time sitting and reading in this store, hoping to meet Mary. It was during this time that others found out about my journey and they would tell me about other indies and that's what happened with Greg during my wait. Thanks to him, I've added about a dozen more indies to visit and naturally they're scattered all over the country. Heck, he even bought a copy of My Bookstore here, my unofficial guidebook. So my journey continues with many more destinations. I'm glad I didn't decide to do a blog about dentist offices. This one is much more fun. Winter's coming, Minnesota, and I've got just the place for you to stock up on some books. Go to an indie and buy a book. Bonsoir. RECENTLY FINISHED: Fire Shut Up In My Bones, Charles M. Blow. Memoir of this NY Times columnist growing up in Louisiana in the 70s and 80s. Great story of all he overcame to arrive at his position today. CURRENTLY READING: The Cuckoo's Calling, Robert Galbraith. Author is a pseudonym for J. K. Rowling who wrote the Harry Potter series. This is adult fiction. RECENTLY PURCHASED: Butcher's Crossing, John Williams. Fat Boy vs. The Cheerleaders, Geoff Herbach. The title grabbed me. I was so anxious to get here I jay-walked right over! What's wrong with this picture? Books displayed outside. In Minnesota. In November. Do the math! View to the right as I enter the store. Looking straight back through the store from the front door. 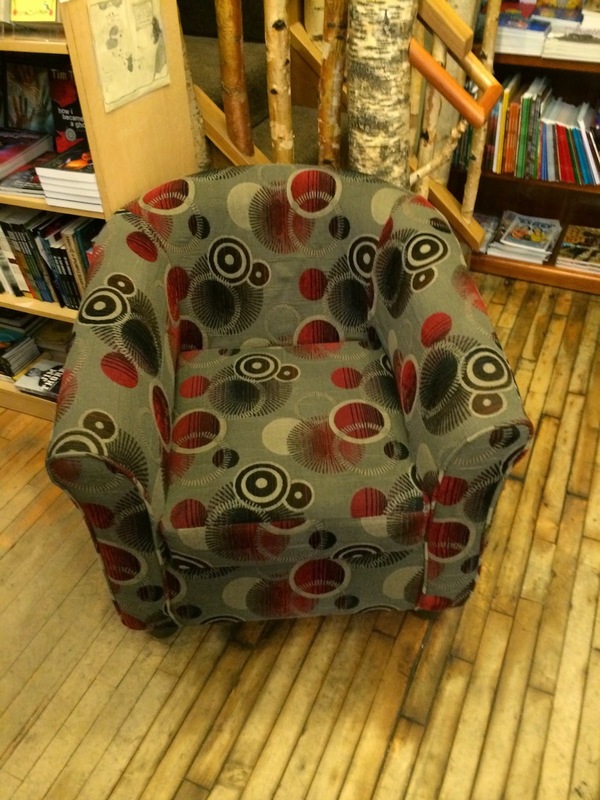 This is where I sat when Greg filled me in on all of the additional independent bookstores I need to visit. Great selection of greeting cards. One of the walls of books in the front of the store. 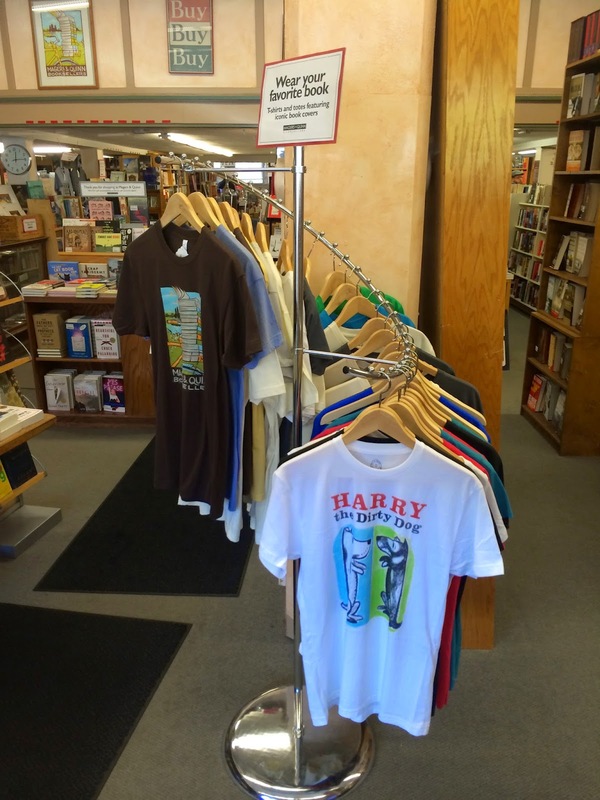 You're going to need a t-shirt to go with that book you'll buy. These collectables are under $175. The expensive ones are upstairs in an office/display area. One of the many aisles of books. Can I get an "amen?" A great motto for every indie. This area is in the back of the store. Looking for something specific? They can help you here! 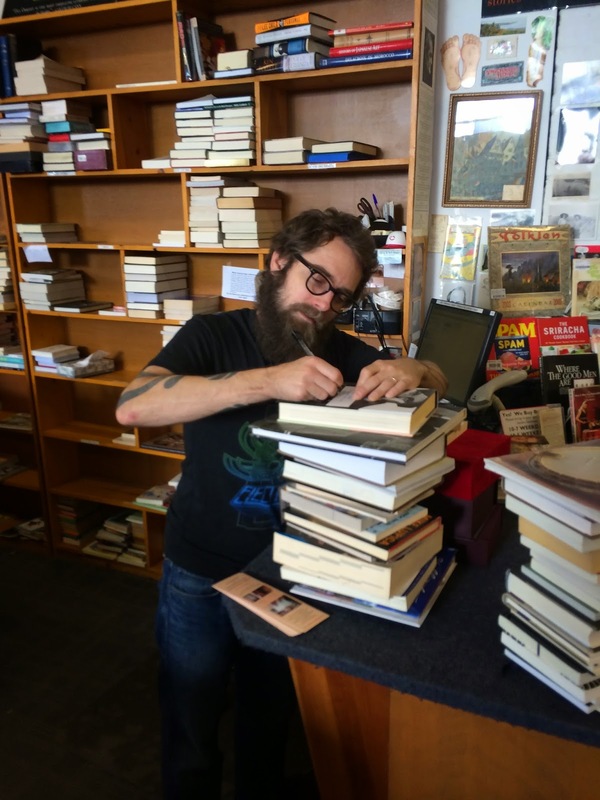 Conrad signs, My Bookstore. He's also in charge of the used book inventory. Here are more of the collectable books upstairs. My view from that upstairs collectable book/office area looking down on the front of the store. Conrad took a lot of time to talk to me about this terrific indie. Thanks for a great visit!